Our Manchester range is beloved for its uniquely modern take on the stately design that defined the luxurious style of early Colonial America. The Manchester Corner TV Stand, shown above in a richly finished onyx stain, brings new dimensions of convenience and quality to an established line of family favorites, with its space-saving design and subtle details making it the perfect living room or bedroom TV stand. With a completely customizable design and hand-finished, sumptuously smooth surfaces, this corner TV stand brings a sense of elegant luxury to the everyday. 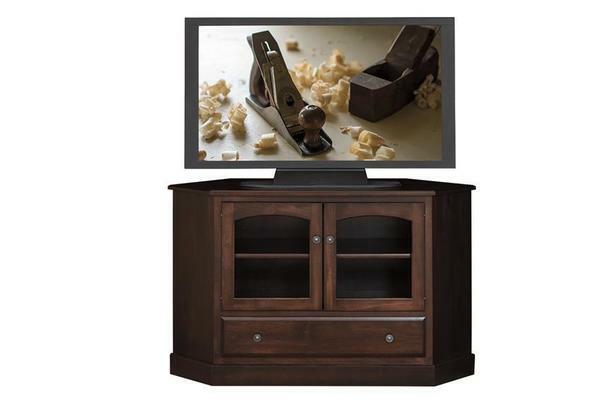 Your Manchester Corner TV Stand will be built to order from your choice of wood and stain in a small Amish woodshop in the northern United States. If you have any questions at all - or if you would like to see physical samples of our woods and stains at no extra cost - please get in touch with us by phone or by email at any time. We're in love with how this TV stand combines modern convenience with traditional American heirloom woodworking, and we would love to talk with you about the sense of heritage and luxury that it brings to the home.